So I mentioned a few new expensive rubber band scams in a previous post and have been promising a review of negative ions for a week or two. Well, here it is (and it’s a bit of a monster…)! The EQ Bandz website that I mentioned in a previous post details a number of claims concerning their product. When you google the terminology they use, it seems that these phrases are repeated verbatim across the internet, so it’s worth taking a closer look at them. I think chunks of the text are copied from this WebMD article. Which particular ions are forming the bulk of the ions in the air is unclear, and the levels of these ions vary with air pollution, time of day, season and weather. Following their discovery in 1900, a lot of research went into the biological effects of negative ions in the first half of the 20th Century and, just like today, many grandiose claims were made about their benefits. It was these unsubstantiated claims that led to the Food and Drug Administration in the USA banning the sale of ionizers for medical purposes in the mid-1950s. Research almost completely halted at this point, but experienced a resurgence at the hands of two scientists: Albert Krueger working on animals, and Felix Sulman working on human hormone levels. Krueger worked on a number of different topics, demonstrating that negative ions influenced plant growth and animal hormone levels, as well as pathogen abundance (e.g. Krueger and Reed, 1976). Inspired by Krueger, Sulman carried out a number of studies on the effects of meteorological phenomena (desert winds) on hormone levels in Israel. The idea was that certain winds cause variations in ion concentrations. He found that treatment with negative ions reduced the incidence of serotonin-related ailments (Sulman et al., 1974a,b). OK, I tracked this one down fairly easily. It’s a report by the Agricultural Research Service branch of the USDA. The two studies (Gast et al., 1999; Ritz et al., 2006) looked at ways to remove dust from the air and found that electrostatically-charged were extremely effective. So, a win for the pro-ion crowd, eh? Not so fast… You see the ionizers used in these studies were big, mains-powered units: “Each ionizer bar was 50.8 cm long, with 1.27×1.27 cm cross sections and electrodes every 1.27 cm. The bars were…operated at –20,000 V direct current by a current-limited power supply” (Gast et al., 1999). These are hardly energy bracelets… Furthermore, you might have been wondering why the USDA was involved in all of this. The reason is that the whole study was conducted in a bloody chicken coop! The authors were interested in reducing dust and infection in chicks! Finally, the finding that there is was “95% less bacteria” is due to the fact that the bacteria are sat on the dust particles. A summary of the study stated that the treatment “reduced Salmonella in air samples by 95 percent in a room with Salmonella infected egg-laying hens.” So we have evidence that if you are in a chicken coop with Salmonella infected egg-laying hens then there is less Salmonella in the air when you have mains-powered ionizers. Good to know! Now I really want a $40 rubber band! This is a funny one… Googling “Nagao Katsharu” only brings up balance band websites (and bloody hell are there hundreds, all using the same quotes!). Also, putting the name into Google Scholar yields nothing at all. Searching PubMed on the full author name gives nothing, either. I’ll chalk this one up to an obscure grey-literature reference, but until I can read it for myself I’m going to label the claim as “unsubstantiated”. If anybody knows of this study then let me know! Without the reference, all we can say is that enhanced oxygenation of the skin will result in greater skin cell replacement. This is an area that is currently being researched for skin grafts, which can be greatly improved by increasing blood and oxygen flow to the affected area. Negative ions help prevent respiratory-related illnesses In a study conducted in a Swiss textile mill, negative ionizers were placed in two, 60’ by 60’ rooms, each containing 22 employees. In one room, the negative ion electronic air cleaner was turned on during the course of the study. In the other room, the negative ion air purifier was permanently turned off, although the employees in this room were led to believe they were working in a room enriched by negative ions. During this six-month study, a total of 22 sick days were lost by employees working in the room in which the negative ionizer was operating. In the room where the machine was not operating, a total of 64 days were lost to sickness. During a month-long flu epidemic, the first group lost a total of 3 days to sickness, while the second group lost a total of 40 days to sickness (Stark, 1971). I cannot find this reference anywhere, although based on another source it appears to involve a reduction in serotonin levels due to anion exposure. The patients involved in the study all suffered from an over-production of serotonin which was causing sleep problems. Exposure to negative ions apparently reduced the serotonin levels, thus relieving the problem. This is a very specific group of people suffering from a specific ailment who were helped by an air ionizer. You cannot extrapolate from this study to say that rubber bands help everyone sleep better. Again, it is mains-powered air ionisers, not wrist bands, that are being tested. As opposed to positive anions? Like Claim 4, this hinges on negative ions increasing blood flow. The Hawkins (1981) study, mentioned in Claim 3, demonstrated a weak but significant increase in mental alertness in the presence of ion supplementation. However, specifying a mechanism such as “increased blood flow to the brain” might be a bit premature. Certainly I haven’t been able to find anything to support that mechanism (but I would love to hear if anybody knows of a study). I think Equilibrium dropped the ball here – increased circulation would produce more heat in the extremities rather than “dissipating” heat. But where is this measured? How is it measured? Is this in the material itself? How far from the bracelet can you detect the effect? I have assumed for the sake of argument that the bands discussed here actually do emit ions As a comparison, the room ioniser used by Terman and Terman (2006) produced ion flow rates of 4.5 x10^14 ions per second (high-density exposure) or 1.7×10^11 ions per second (low-density exposure). These units were positioned 60cm from the pillow on which the participant was resting. Gast, R.K., Mitchell, B.W., and Holt, P.S. (1999) Application of negative air ionization for reducing experimental airborne transmission of Salmonella enteritidis to chicks, Poultry Science, 78: 57-61. Hawkins, L.H (1981) The influence of air ions, temperature and humidity on subjective wellbeing and comfort, Journal of Environmental Psychology, 1: 279-292. Krueger, A.P., and Reed, E.J. (1976) Biological impact of small air ions. Science, 193: 1209-1213. Ritz, C.W., Mitchell, B.W., Fairchild, B.D., Czarick, III, M., and Worley, J.W. (2006) Improving In-House Air Quality in Broiler Production Facilities Using an Electrostatic Space Charge System, Journal of Applied Poultry Research, 15: 333-340. 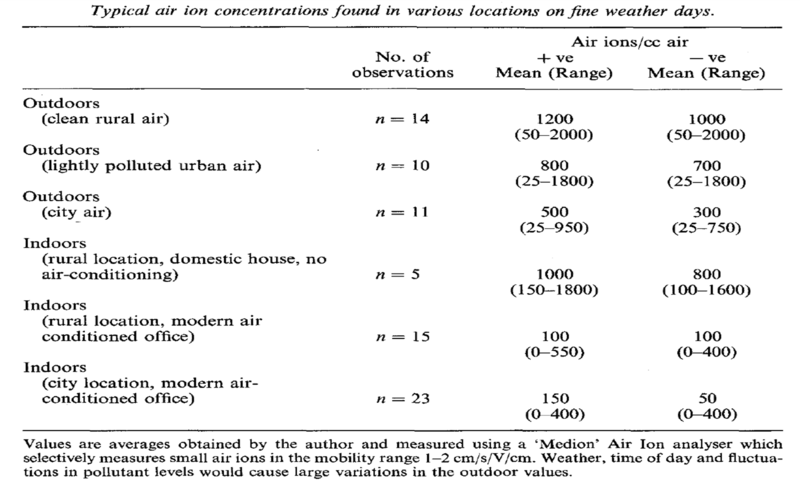 Sulman, F.G., Levy, D., Levy, A., Pfeifer, Y, Superstine, E. and Tal E. (1974a) Air-ionometry of hot, dry dessert winds (Sharav) and treatment with air ions of weather-sensitive subjects, International Journal of Biometeorology, 18: 313-318. Sulman, F.G., Levy, D., Pfeifer, Y, Superstine, E. and Tal E. (1974b) Effects of the sharav and bora on urinary neurohormone excretion in 500 weather-sensitive females, International Journal of Biometeorology, 18: 313-318. Terman, M. and Terman, J.S (1995) Treatment of Seasonal Affective Disorder with a High-Output Negative Ionizer, The Journal of Alternative and Complementary Medicine, 1: 87-92. Terman, M. and Terman, J.S (2006) Controlled Trial of Naturalistic Dawn Simulation and Negative Air Ionization for Seasonal Affective Disorder, Am J Psychiatry, 163:2126-2133. Terman, M., Terman, J.S and Ross, D.C. (1998) A Controlled Trial of Timed Bright Light and Negative Air Ionization for Treatment of Winter Depression, Arch Gen Psychiatry, 55: 875-882. Although you certainly have done some research, this article is completely biased. You utilized too much emotion, thus rendering your argument ineffective. You come across as arrogant and condescending, and thus I don’t deem this article a credible source. If you could point out the places in which I misinterpret the research then I would be happy to discuss them with you. This is a non sequitur. How does emotion negate an argument? This is an excellent review of the literature. I’m surprised by the data. I can’t think of any possible mechanism for how ions affect biology, and, as you say, little research has been done. As a biologist, I’d be interested in working with a physicist to try to come up with some reasonable hypotheses. I was looking for more information about this product and found your website. This “negative ions” terminology used for different purposes, usually not even related, is everywhere on Internet. For exemple, the « Q-Ray bracelet » wich Federal Trade Commission (FTC) sued (Park and QT Inc) for false advertising : finally, they will repay at least $22.5 million to people who bought their product (http://www.skepdic.com/qray.html). Hi BBB, thanks for the comment. I was having the same trouble as well. They seem to be based on the placebo effect, but very few proper trials have been carried out. That’s the reason for my post: “is there any reason at all to think that these bracelets might work?”. Although I agree with your argument that the bands are probably not as effective as the air ionizers; I still feel that the research from the effects of negative ion treatments would be beneficial for our health– if our doctors would actually do the necessary research that is needed to make this a viable option for medical treatments instead of catering to the pharmaceutical industries! If the medical community wanted to really cure diseases; instead of just treating our symptoms, they would be doing more research in the areas of alternative medicinal therapies such as negative ion detox, multi-wave oscillators, sound and light therapies, etc. The point that most medical professionals miss is that by continuing the use of pill based medicines and radiation treatments– they are not really advancing medicine; they are just playing into the hands of the corporates who want to keep people sick so they can keep making money! Lets face it-they make more money by keeping people sick, so why would they want to focus on medicine that actually works? Think about it. If you are a doctor or medical professional reading this–I hope you research these areas before the diseases kill us all! Remember the plague, smallpox, and the influenzas that killed so many soldiers in the 40’s? There are still alive and well, despite what you hear from the medical community! How about some real medical research that will actually cure people instead of making them sick! Negative ion research is interesting, but there just isn’t enough preliminary evidence to justify a major clinical trial for many conditions. However, there have been clinical trials conducted using negative ions to treated various depression-related conditions (http://clinicaltrials.gov/beta/results?term=%22negative+ion%22&Search=Search) and asthma (http://www.ncbi.nlm.nih.gov/pubmed/12917939) so it isn’t as though this isn’t happening. I’m afraid we can’t rely on testimonials as evidence for efficacy. Sometimes small case studies can be published can pave the way for larger studies, but we typically need some form of plausible mechanism by which the intervention can have an effect before we embark on expensive research. There are actually fewer people dying from cancer (mortality rates are falling) although there are more people contracting cancer (incidence rates are rising). This latter effect comes from the fact that we are living much longer and much healthier so something has to kill us! Cancer is the disease of the old and otherwise healthy! You keep making nonsensical arguments. Wouldn’t the discovery of a cure for cancer be the biggest pay-off in medical history? It would be worth a fortune! It isn’t in corporations’ interests to not make breakthroughs. Finally, the medical community has never claimed to have eradicated the plague or influenza (although we have effectively eradicated small pox from the wild) – but we have them firmly under control. Thanks so much for doing all this research to give some information on the source of studies of the band claims, and also some perspective on the amount of anions generated (in the air) in those studies vs. the amount supposedly generated by the bands. Thank you so much for debunking these things. I was looking on a “mobility” website for something for one of my patients and came across exactly the claims you mentioned above and KNEW they were crap. I sent them an email saying so, and intend to contact the state attorney general with a goal of making (at least this one website) stop selling them to people who don’t realize rubber bands will not make them healthy. argh! 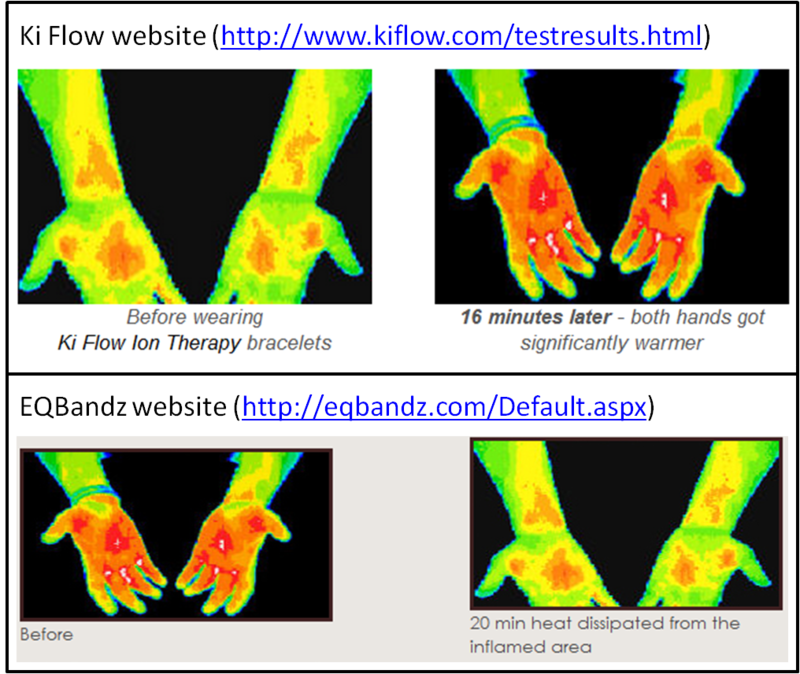 Good arguments and research on info that is available about wrist ion bands.You make a good point about a larger source of energy that would be needed to see any sig. difference. I think the equivalent of a thunderstorm that will clear the air (the rain can then wash the dust particles) is needed. Maybe one can create a negative ion shower ‘experience (like a sauna experience) along these lines.